Believed to be the oldest amongst wild cats, the European Wild Cat (Felis Silvestris Silvestris) was once found through major parts of Europe. Larger than its African cousin, the European cat also has a more dense fur. Color ranges from gray to brown, with stripes often running across the body, though not as prominent in some other cat species. The coat is often marked by light colored patches on trunk. Skull is broad and tail short and bushy, with a black tip. Body length ranges from half a meter to one meter. Weight may be between two to twenty pounds. 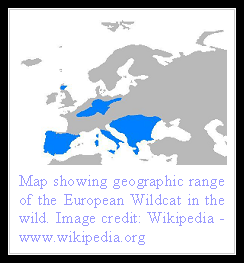 Also known as the Forest Wild Cat, the European Wild Cat prefers densely wooded areas though it is adaptable enough to survive in swamp territories unlike most other felines. Crepuscular, it often displays activity during day time as well. Though hunting is largely done on the ground, the cat may adapt an arboreal style in pursuit of prey. Diet consists largely of small mammals (mainly rodents followed by rabbits and hare), birds, reptiles and insects. Fish are seldom taken. Mating season is around February and March every year and an average of three kittens are born after a gestational period of just over two months. They gain independence at five months and sexual maturity at twice that age. 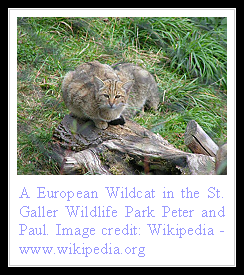 Largely persecuted in the past for fear of their attacks on poultry, the European Wild Cats are protected today owing to their beneficial influence in removing rodents that harm trees. The most serious threat today is breeding with feral and domestic cats that has led to large scale dilution of the gene pool. Pure bred variants of the original species are hard to find today. Other serious threat is from disease that spreads from feral cats since the wild cats have little immunity after thousands of years of isolated existence. Looks like our house cats! Hey my hypo (spastic) cat looks like them! i think my cat is part european wild cat. Human Resource Management(HRM) Assignment Help is a homework writing service provided by the team of best HR experts from the UK, Australia,US at affordable price.